This guide will show you how to create a new Inigo card in the app. From the homepage (or "cards" page), please click "more cards." This will open the window shown above. Please click on the + button in the bottom right-hand corner to add a new card. The next page will prompt you to add a title to the new card. It is helpful to choose a title that will help you to organize your cards, and this title will be visible to contacts that you share the card to. Users have been very creative in titling their cards, from using the space to give their business title or to name promotions and events. The card title can have a maximum of 50 characters. 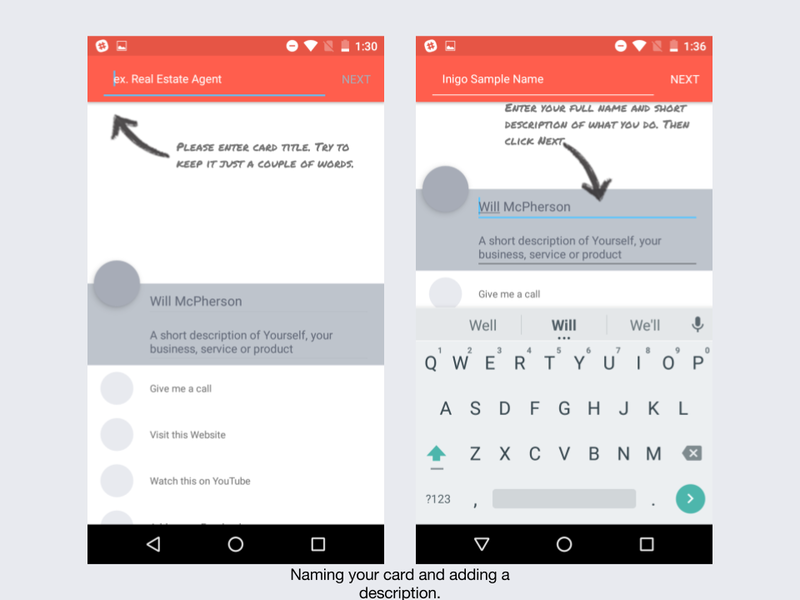 The next step in creating a card is to add your name and a short description. Your name can be different on each card, but it will automatically fill in the name you used when signing up unless you change it. Descriptions can be a maximum of 250 characters and are one of the best spaces on your card to give new contacts information about yourself. Some users will input their job title, company name, and news about their business, but you may put whatever you want your contacts to see! 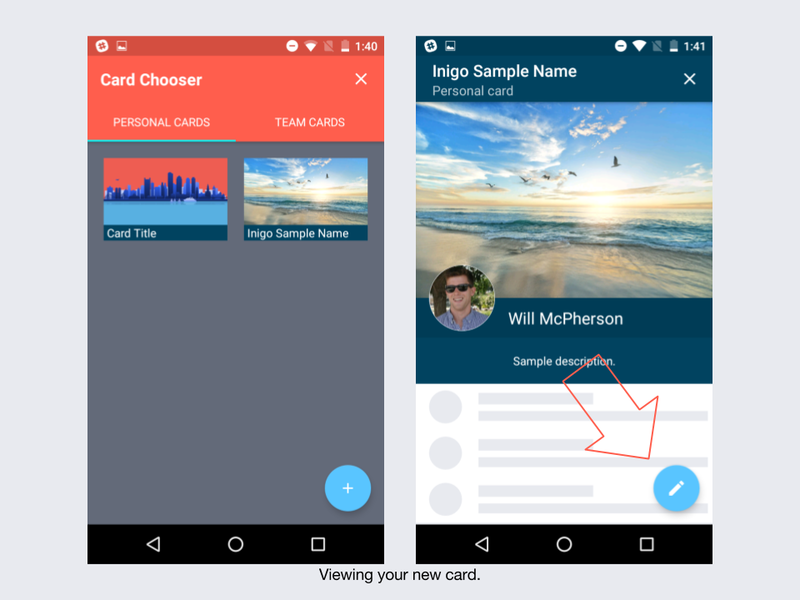 Your card will now appear under "Personal Cards" in the "More Cards" page. To continue editing this card, please select the card so that it can more to the homepage. 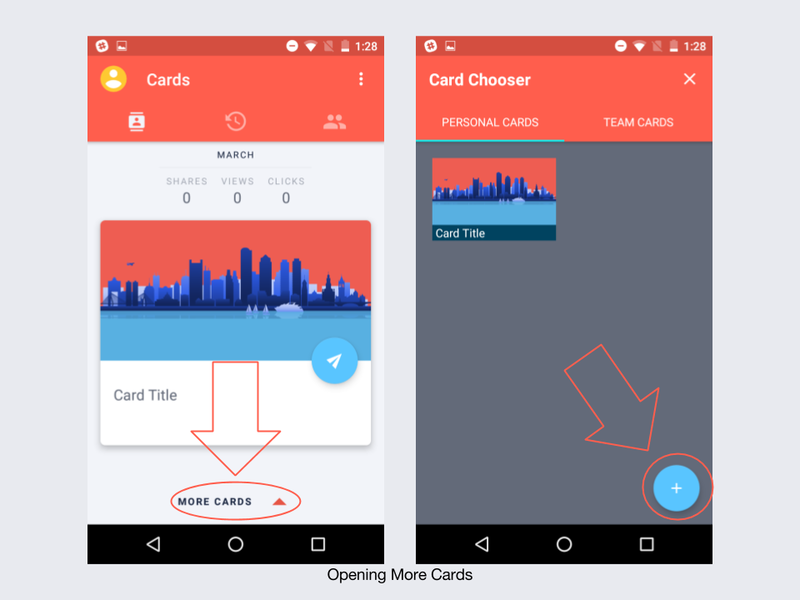 Once there, you can open the card and click on the editing button in the bottom right-hand corner. To add more visual appeal and elements to your card, please view our guides on Adding Backgrounds, Editing Basic Details, and Creating Elements.